First found in Ile-de-France, where this remarkable family has been traced since the 12th century. First found in Buckingham where they were seated from very early times and were granted lands by Duke William of Normandy, their liege Lord, for their distinguished assistance at the Battle of Hastings in 1066 A.D.
A multitude of spelling variations characterize Norman surnames. Many variations occurred because Old and Middle English lacked any definite spelling rules. The introduction of Norman French to England also had a pronounced effect, as did the court languages of Latin and French. Therefore, one person was often referred to by several different spellings in a single lifetime. The various spellings include Mallet, Mallett, Mallit, Mallitt, Malott, Mallot. First found in Suffolk where they were seated as Lords of the Manor of Cidestan. Endless spelling variations are a prevailing characteristic of Norman surnames. Old and Middle English lacked any definite spelling rules, and the introduction of Norman French added an unfamiliar ingredient to the English linguistic stew. French and Latin, the languages of the court, also influenced spellings. Finally, Medieval scribes generally spelled words according to how they sounded, so one person was often referred to by different spellings in different documents. The name has been spelled Clair, Clare, Clere, O'Clear, O'Clair. First found in Suffolk where they were seated from very early times and were granted lands by Duke William of Normandy, their liege Lord, for their distinguished assistance at the Battle of Hastings in 1066 A.D.
Spelling variations of this family name include: Sinclair, Saint Clare, Sancto Claro, Singular, Sinclaire, Seincler, Sanclar, Sincklair, Sinclear, Sincler. First found in the barony of Roslyn near Edinburgh in Scotland. First found in Bavaria, where the name Albini became noted for its many branches with the region, each house acquiring a status and influence which was envied by the princes of the region. First found in Brittany, where the family first originated and maintained their status as one of the more distinguished families of the region. Norman surnames are characterized by a multitude of spelling variations. The frequent changes in surnames are largely due to the fact that the Old and Middle English languages lacked definite spelling rules. The introduction of Norman French to England, as well as the official court languages of Latin and French, also had pronounced influences on the spelling of surnames. Since medieval scribes and church officials recorded names as they sounded, rather than adhering to any specific spelling rules, it was common to find the same individual referred to with different spellings. The name has been spelled Bellamy, Belamy, Bellamie, Belamie, Bellamey, Bellame, Bellasme, Bellamly. First found in Shropshire, where they had been granted lands by King William, their liege lord, after the Norman Conquest in 1066 A.D.
Anglo-Norman names tend to be marked by an enormous number of spelling variations. This is largely due to the fact that Old and Middle English lacked any spelling rules when Norman French was introduced in the 11th century. The languages of the English courts at that time were French and Latin. These various languages mixed quite freely in the evolving social milieu. The final element of this mix is that medieval scribes spelled words according to their sounds rather than any definite rules, so a name was often spelled in as many different ways as the number of documents it appeared in. The name was spelled Bohon, Bohun, Bone, Boon, Boone, Bohan, Bound. First found in Sussex, where they had been granted lands by King William after the Norman Conquest in 1066. Church officials and medieval scribes often spelled early surnames as they sounded. This practice often resulted in many spelling variations of even a single name. Early versions of the name Lacy included: Lacey, Lacie, Lacy, de Lacy, Lasey, Lassey. First found in county Limerick where they had been granted lands by Strongbow after the invasion of Ireland in 1172. Norman surnames are characterized by a multitude of spelling variations. The frequent changes in surnames are largely due to the fact that the Old and Middle English languages lacked definite spelling rules. The introduction of Norman French to England, as well as the official court languages of Latin and French, also had pronounced influences on the spelling of surnames. Since medieval scribes and church officials recorded names as they sounded, rather than adhering to any specific spelling rules, it was common to find the same individual referred to with different spellings. The name has been spelled Mortimer, Mortimor. First found in Herefordshire where they were seated from very early times and were granted lands by Duke William of Normandy, their liege Lord, for their distinguished assistance at the Battle of Hastings in 1066 A.D.
Spelling variations of this family name include: Montgomery, Mongomery, Montgomerie, Mungummery. First found in Renfrewshire (Gaelic: Siorrachd Rinn Friù), a historic county of Scotland, today encompassing the Council Areas of Renfrew, East Renfrewshire, and Iverclyde, in the Strathclyde region of southwestern Scotland, where they were granted lands by Malcolm Canmore, King of Scotland. I have been having a discussion with this person who insists that her ancestors Thomas was a descendant of the Algernon Capell, 2nd Earl of Essex and his wife Lady Mary Bentinck. At first it was just a harmless discussion on the Tudors Wiki, but now she has taken it upon herself to put the person up on the actual Wikipedia. Could someone PLEASE look at this link and tell me who is correct or not.. because this person is screwing up wiki now and putting this person on wikipedia and won't stop putting the person back up. I have looked everywhere to find this person that they are talking about and there is nothing to be found on him. If he was the son of the Earl of Essex I'm pretty sure he would be listed somewhere, but he is not. Golden Aged: "I'm a great-granddaughter of Mary Boleyn!!" Too funny that you posted this here as I was just reading this thread over on The Tudors Wiki. All I could think was that PPaarabs was rude and that GoldenagedER had the patience of a saint! Sadly I think this is a case of her finding what she is looking for because that is what she wants and expects to find. It may not be the truth but it is what she believes so it must be so. She stated in a post "I am 65 and have always known there were royal bloodlines in my past. I am also related to the Harris family which links me to John Of Gault and Katherine Swynford and the royal lines are unlimited." I popped over to ancestry.com and found a tree that pointed back from Terrell Covington to the Boleyns. But as you noted the sources are not there to back up the info. She also stated that all she had to do was go back 5 generations to Terrell and then ta-da it's a straight line to royalty. What I think is that she got to the ancestry site, worked back to Terrell and then just went up a tree that took it all the way back to Algernon Percy. Whether this tree is right isn't the point to her, it's a straight line back to royalty. Hope this might shed some light. I found that this person was trying to post this person on wiki and had it. I am actually Goldenaged.ER -- she couldn't answer the questions and she couldn't give me sources.. it was just 'my family member told me..' and whomever is doing this on wiki, I'm pretty sure it's her as I traced her IP address... she directed me to the National Dictionary where she said she found Thomas Capell -- thing is.. it wasn't him, the person listed - he was the son of the 4th Earl and he had NO issue! Edward Capell b. 1735 in Sussex, VA, son of Thomas Capell and unknown m. Judith Pritchard. Thomas Capell b. 1705, Essex England, son of Edward which has an unknown birthdate and Anne Robinson m. Anne Unknown. Even after looking at this tree that it came from online(another tree that actually looked like it had the correct lineage, but to another Capell family which is listed on Tudor Place, but that wasn't correct either).. which is the only thing I can find on this past Edward, they have incorrect people again.. making it look like they are connected to Sir Arthur Capell(not even related to the Earls of Essex) through a William Capell b.1590 and in the tree where I found this it has question marks after the 1590, died in Maryland (1590? died in Maryland?) Married Unknown Lemon. On the Tudor site I look at, that line ends with William Capell and I have looked all over the internet for a William who married an Unknown Lemon and that is the only tree that has it listed like that. Also, there are NO sources in the tree at all. It's like they just guessed their way through, didn't check and assumed because the dates were close that perhaps that was the person and therefore put that person down in a document misleading people like you into thinking certain things. That site has nothing on the Harris family linking them to anyone. Like I said, I found that tree on ancestry and then asked her if that was who she was talking about, the Thomas that she thinks is linked to the 2nd Earl, she responded with something and then two hours later like after she tried to find proof or something she said yes. Unbelievable -- all this over wanna-be royal relations. But really it's just insane -- Earls kept records of their children I'm pretty sure of it..Ok, I get it. She desperately wants to be related to royalty somehow. Poor woman. LOL Lady Meg that is the quote of all time! Recently I've watched the movie "Libertine" about John Wilmot.Of course it has some drops of Romanticism,while the reality was quite different.I found on the Wiki page that he was the last bearing this title as he son died in childhood and daughters cannot inherit the title(due to the male primogeniture,as it was Duke of Dorset's case as well).It is a fact that Elizabeth Barry,one of the first women who tried the route of acterss,had never been married but it 's well-known that she had 2 kids(daughters I think) from John Wilmot and Sir Gerbert Etheredge.But on her wiki page it's not mentioned this fact.The kids were given to their fathers and educated by others.Does anyone have anything about their destiny? I've understood that it was common habit for nobles to pay for their out of weddlock children. John Wilmot, 2nd Earl of Rochester was not the last holder of the title. He died on 26 July 1680, and his son Charles Wilmot did in fact inherit the title, becoming the 3rd Earl of Rochester. Elizabeth Malet, John's widow, died 20 August 1681.. and unfortunately, the 3rd Earl died on 12 November of the same year. He was about eleven years old, and with his death the earldom became extinct. The Rochester estate was then divided between the 2nd earl's three legitimate daughters, Anne, Elizabeth and Malet Wilmot. Anne married Henry Bayntun and the Hon. Francis Greville. Her sons were the 6th and 7th Barons Brooke of Beauchamps Court and her grandson was Francis Greville, 1st Earl of Warwick. The current 8th Earl of Warwick is her direct descendant. Elizabeth married the 3rd Earl of Sandwich. Her son died before his father, but her grandson was the famous 4th Earl of Sandwich, from whom the sandwich gets its name. The current 11th Earl of Sandwich is her direct descendant. Malet married John Vaughn, 1st Viscount Lisburne, and was the mother of the 2nd and 3rd Viscounts. Her grandson became the 1st Earl of Lisburne. The current 8th Earl of Lisburne is her direct descendant. The daughter of the 2nd Earl of Rochester and Elizabeth Barry was named Elizabeth Clarke. She was born in December 1677 and was taken into the earl's household about 1678, but I'm unsure whether she remained with the Wilmot family after her father's death, although he reportedly provided for her in his will. From one of his letters to Elizabeth Barry, it appears that John Wilmot's custody of their daughter was temporary and not meant to be a permanent arrangement. I presume however, that she was still with the Wilmot family when she died at the age of twelve or thirteen.. so 1689-1690. Elizabeth Barry's other daughter with Sir George Etheredge also died young. George settled 6000 pounds on his daughter with Elizabeth, and it is not known exactly when she died, but apparently before she was old enough to marry. I have never discovered this child's name. What is known is that when Elizabeth Barry died, she had no living heirs. Descendant of Sir Francis Drake. "THE QUEENS PIRATE"
Having grown up all my life with the family lore of our being "related to" the Earls, I have something to say about this thread. I suppose it is true that many people do want to be related to the royals (although my understanding is that only to the level of "Duke" may one consider himself related to royalty - no matter. At least my ancestors on one side of the family fought on this Continent against those repressive bastards in England to accomplish what is probably a faux Republic here. They at least believed in what they were doing. For some reason, down to my grandfather's generation, he said, "The Capell's were loyal." An odd statement for a man born shortly after the American Civil War I think. The South was not so dedicated to the "Union" and my grandfather most certainly was a southerner if nothing else. If it were not for the fact that I have run into a lot of pseudo-scholars who believe that skepticism = sophistication, I would not reply to this thread, but the blatant slap at those who are pursuing their genealogy in earnest is an affront to the group I feel. You might wish to remember that this "Royal Forum" would in most likelihood be spat upon by any genuine royals I'd like to add (if they would deign to spit on it), but further that this site advertizes dating services and gambling - so pretense here will not do. That said, I personally have to wonder, if I, a Capell, could prove I were related to those Earls if I would be proud or not. They are considered "royals" after all, but my sympathies lie elsewhere as you may have sensed. The British Crown after all has been responsible for misery worldwide. To be the spawn of its loins in not necessarily a mark of pride. Nonetheless, I would like to know. I want to know sufficiently that I once wrote the Viscount of Malden to ask him if he knew anything. Of course he did not, and short of his sending me a lock of hair to prove the point - I shall die unknowing in all likelihood. I am curious though. Because we grew up with the family lore, there are several of us who would like to know. Capell is not a common name in the States. The Viscount, by the way, having some decency I suppose, said that we were 'probably distant cousins' - I had to smirk at this reply - he dare not acknowledge more even if he knew it - I was planning to show up at his door with my hand out? Egads what a shame the genealogical community is - so loaded with posers and people who are looking for their identities in the past. God bless you. I've re-titled my posting and added additional information, sorry for the double post. I'm doing some research and have come to find myself looking at the Carrington Smiths of Rivenhall in Essex. They gave rise to The Smiths of Wooten Wawen in Warwick. They are descended from John Carrington, Esq. who later was known as John Smith, Esq. His coat of arms was four peacocks quartered by a red cross on a white field, rather unique. 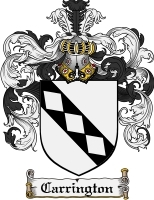 His Carrington ancestry used arms similar to these: l It appears this is the male line that gave rise to Lord Peter Carington by way of a Sir Francis Smith and later a Sir Thomas Smith of Cropwell Botler. It's the line Samuel and Abel Smith of Smith Bank & Co. The earliest known Carrington was a Hamo de Carentan who was a nephew, allegedly, of Baron Hamo de Massey who was a contemporary (or one or two generations from) William the Conqueror. Hamo de Massey is said to have family ties to Hugh d'Avranches, the first Earl of Chester. I am wondering if anyone knows of any sources, online or real, tangible books, that might shed some light on the origins of the Carringtons who were from Carynton in Normandy, France. Some sources point to Hamo de Carentan as being a natural son of Hugh "Lupus" d'Avranches, but this doesn't really make sense as Hugh and his son and heir Richard, died in The Tragedy of Whiteship. One other hypothesis is that Hamo de Carentan was descended from the first Marquesses of Carentan in Normandy. What I know for certain is that the Carringtons are of the same Norman stock of men as William the Conqueror and probably descend from either Rollo, Rollo's father, or Rollo's grand father on their fatherline. Thank you and I look forward to reading your responses. Are you certain that the Carringtons' ancestors went over to England with William the Conquerer or shortly afterwards? If these men were part of Norman aristocracy it might be worthwhile tracking down Judith Green's 'The Aristocracy of Norman England'. It was published in 1997 by Cambridge University Press and I believe, although it's not cheap, that it's available on Amazon. There is also a thesis online for which I'll give the link. The thesis itself is too general to be of much use to you in your quest, but underneath 'Contents' the author has produced a list of the sources used and some of these might be online and handy. As best I can tell, these early Carringtons came over during the Norman Conquest and later took part in the Norman invasion of Wales. Hugh d'Avranches led the army that allied with Gryffud ap Rhys, an early Prince of Wales. I haven't found Burke's to be of any significant use other than describing the arms some of these early familes bore. I'll take a look at the thesis.